The severe storms that uprooted trees, demolished homes and killed at least eight people in central Oklahoma on Tuesday are expected to weaken Wednesday, authorities said. Donetta Singleton, manager of Bill’s Fish House in Lone Grove, said one tornado’s path took it right past the restaurant. She said the post office was gone and a church was damaged. 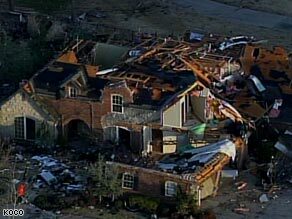 Lone Grove police said a trailer park was hit, while KOCO showed several homes flattened by the storm.